Rumor has it that the remix of the Muslim ban is about to drop, and I’m betting a lot of you protesters want to get your march on this week. 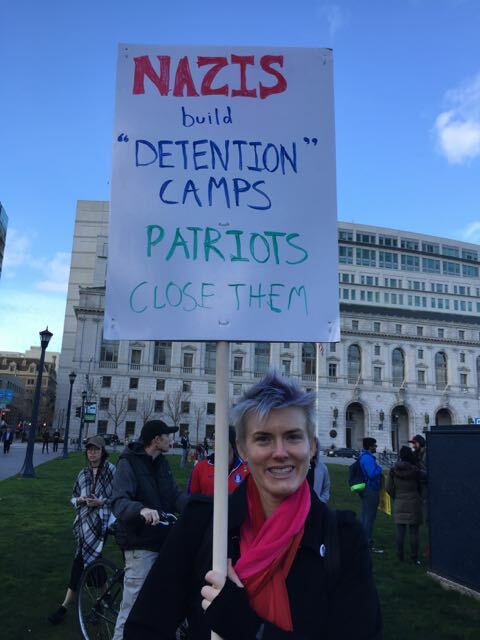 Here for your protesting enjoyment are three sign designs I’ve personally created and tested in the rain and wind of the San Francisco Bay Area: the Extremely Portable, the Reusable Whiteboard, and the Enormous Billboard. But remember, the first rule of Protest Club is: You don’t need a sign to protest!!! You can just show up with your own bad self and that makes you a protester. Sometimes protests have more signs than people to hold them, so don’t feel weird about showing up empty-handed! These designs are too expensive for some folks. I personally have more money than time, but you can substitute other materials if that works better for you. San Francisco police don’t seem to consider sign poles as potential weapons but other police departments (notably the NYPD) do. Check your local ordinances and substitute cardboard tubes if necessary, or use the Extremely Portable sign design which doesn’t have a pole. I include links to order stuff on Amazon, but some people are boycotting Amazon because it sells Trump-family related products. You can also buy the materials for MUCH CHEAPER at hardware stores, art supply stores, office supply stores, and big box retailers. It used to be that many protests were planned weeks and months in advance, on a regularly spaced schedule. No more! Thanks to our exciting and unpredictable executive branch, we often have protests organized with just a few hours notice, several times a week. The modern protestor may wish to be equipped with a sign small and sleek enough to carry everywhere, in a purse or a laptop bag. 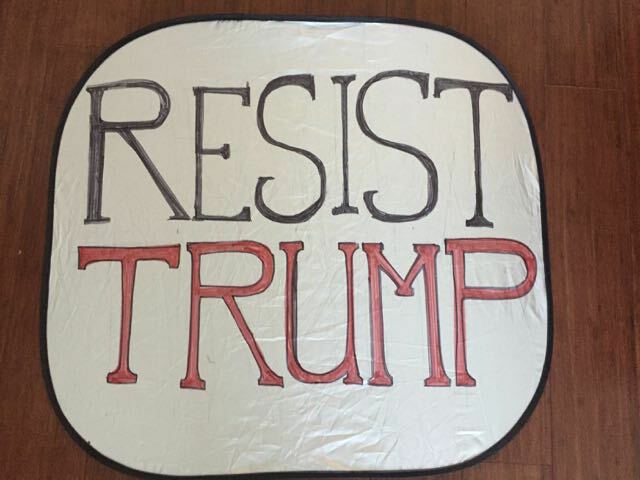 San Francisco Bay Area tip: you can text “RESIST” to 41411 to get text notifications of local protests – you might even see me at one with this sign! Unfold the sunshade. Trace your message using the yardstick and pencil on the silver side, keeping in mind that you need thick letters if you want your sign to be readable from a distance. I suggest a fairly generic message, like “RESIST” or “Trump” with a ban symbol over it. Once you’re happy with your design, fill it in with marker. You’re done! Fold that sign up and keep it next to your laptop or in your purse or in your trunk or in your desk at work – anywhere you might suddenly learn of a protest and want to go join it. Many protests have specific purposes, and my tiny apartment started filling up with out-of-date signs I couldn’t use again. 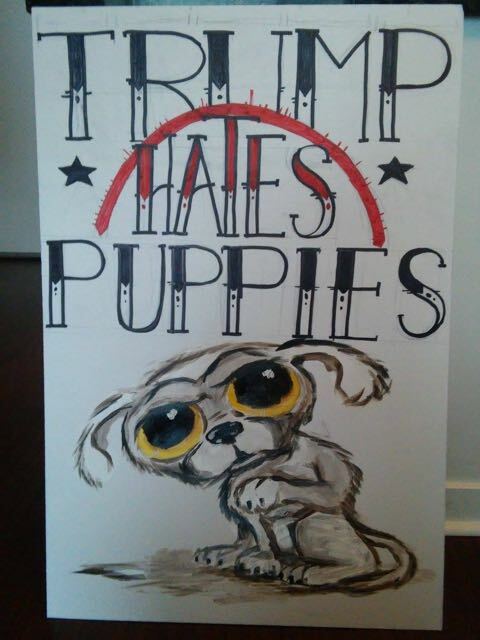 I created this sign so I could have an on-point message at any protest without a lot of time or cost, and improve and update my sign as I got feedback during the protest. About 1/2 of the way from the bottom of the eraserboard, use the yardstick to find the center of the sign. Make a mark with your pencil about 3/8 inch on either side of the center (the distance between the marks should be about 60% of the width of your sign pole). Do this again but about an inch or two from the bottom of the sign. Do this in the same place for each eraserboard. This sign has a problem with the wind catching between the eraserboards and ripping them loose, so we will use zip ties to attach the four corners of the marker board to each other. Repeat the marking process you just did but in each of the corners of the eraserboard: make two marks about an inch apart, aligned in a way so that the zip tie will interfere the least with your sign’s contents. Once you have all your marks made, place the eraserboard over something that it will be okay if a nail comes through the eraserboard (cardboard, scrap wood, etc.). Place the nail on the pencil mark you just made and use the hammer to drive it through quickly. Do this for each of the marks on each eraserboard. 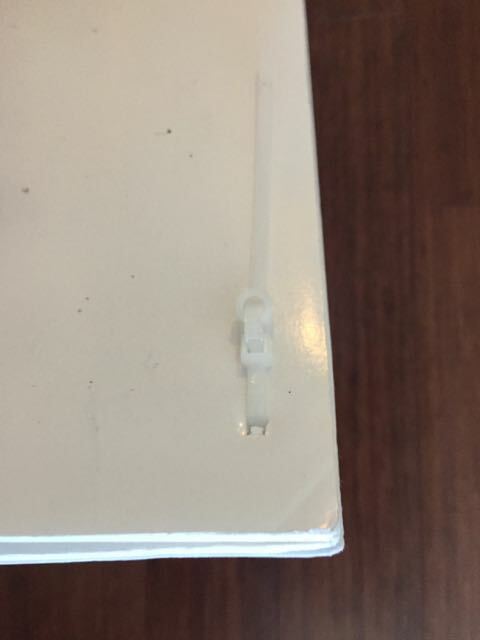 Now take a minute to figure out how your zip ties work – which side has the nubbly bits, which way the tail goes, etc. Sacrifice a zip tie or two if necessary to be sure. Put one eraserboard face down on the floor, put the pole between the holes you just made, and put the other eraserboard on top, face up. Now thread a zip tie through the hole in one board, into the matching hole on the other board, and back through again, with the pole in the middle of the zip tie – but don’t tighten it yet. Do this for the second set of holes too. Now you can tighten the zip ties. Crank them down so the sign doesn’t slip or spin around, but be careful not to rip the eraserboard too much. Do the same for the holes in the 4 corners, though you don’t need to crank them so much – just enough that the edges of each eraserboard touch each other. You are now done until you have a protest you want to go to. 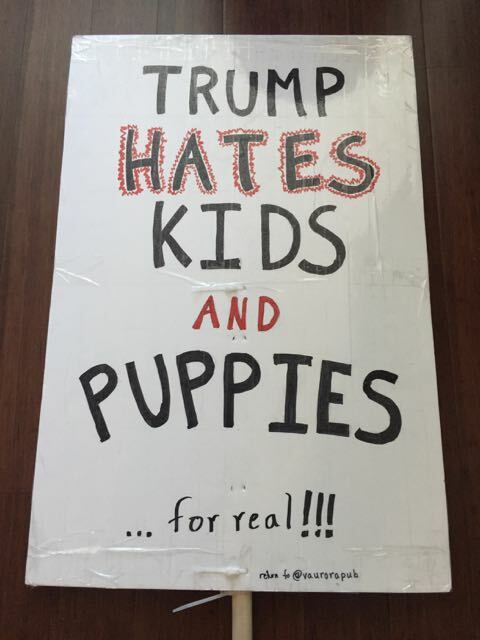 I often wait until I arrive at the protest to create my sign, bringing the markers and a paper towel to erase with (though I often just erase with my glove). I found that the standard dry erase markers are waterproof except for the black color, which washes off with water if you recently applied it. 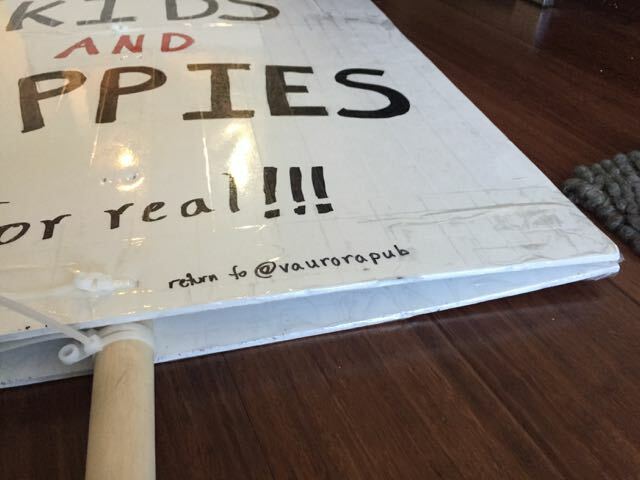 Don’t forget to erase your sign right after the protest – the longer the marker stays on the dry erase board, the harder it is to erase. Use the yardstick and the pencil to trace out your message on the foamcore posterboard, drawing lightly so it is easy to erase major mistakes (don’t bother erasing all the pencil lines, no one can see them). Make your letters thick and easy to read from 30 feet away – on many signs, the letters are too thin to read. You can test readability by taking a photo of your sign on your phone and holding it at arm’s length: can you read it? Use as few words as possible. Once you are happy with the pencil tracing, fill in with the marker. If you expect rain, cover the posterboard with clear packing tape, overlapping the strips by about 1/4 of an inch. 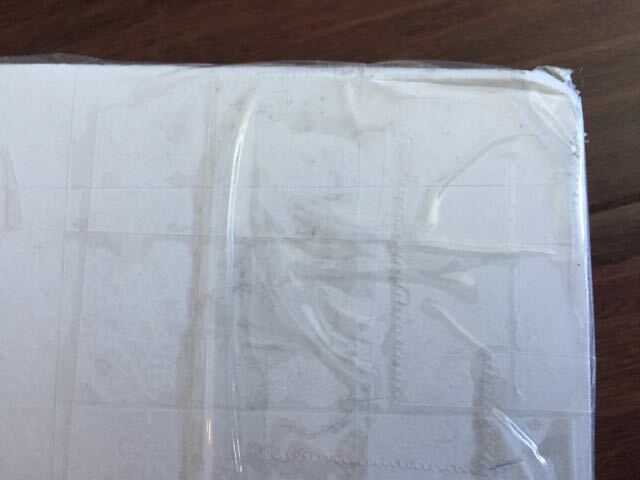 Don’t be fussy about it, just tape quickly and avoid gaps between the tape. You don’t necessarily have to tape both sides. 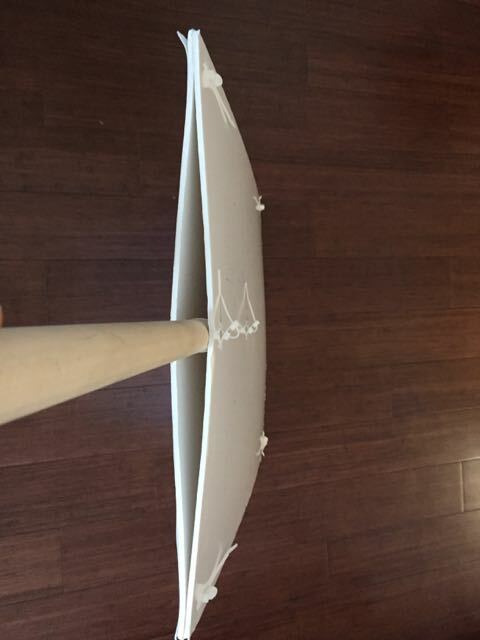 Now you are ready to attach the posterboards to the wooden dowel – the pole. You are about to mark where the zip ties will go, so move them around so they fit between the words on your sign. About 1/3 of the way from the bottom of the posterboard, use the yardstick to find the center of the sign. Make a mark about 3/8 inch on either side of the center (the distance between the marks should be about 60% of the width of your sign pole). Do this again but about an inch or two from the bottom of the sign. Do this in the same place for each posterboard. Place the posterboard over something that it will be okay if a nail comes through the posterboard (cardboard, scrap wood, etc.). Place the nail on the pencil mark you just made and use the hammer to drive it through quickly. Do this for each of the 4 marks on each posterboard. Now take a minute to figure out how your zip ties work – which side has the nubbly bits, which way the tail goes, etc. Sacrifice a zip tie or two if necessary to be sure. 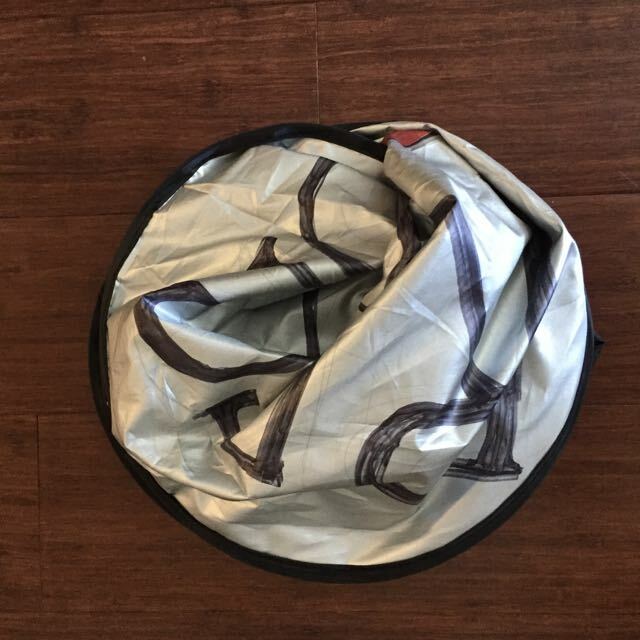 Put one posterboard face down on the floor, put the pole between the holes you just made, and put the other posterboard on top, face up. Now thread a zip tie through the hole in one board, into the matching hole on the other board, and back through again, with the pole in the middle of the zip tie – but don’t tighten it yet. Do this for the second set of holes too. Now you can tighten the zip ties. Crank them down so the sign doesn’t slip or spin around, but be careful not to rip the posterboard too much. Now tape the sides of the posterboards together – this prevents the wind from snapping them around and ripping the holes the zip ties go through. All you need is a strip of packing tape around the top, bottom, and middle of the signs. If the sign tends to slide around on the pole too much, add two more zip ties on the pole just underneath the bottom zip tie that threads through the sign. It should stop it from sliding down, but still make it possible to pull the pole out of the sign if necessary. That’s it! 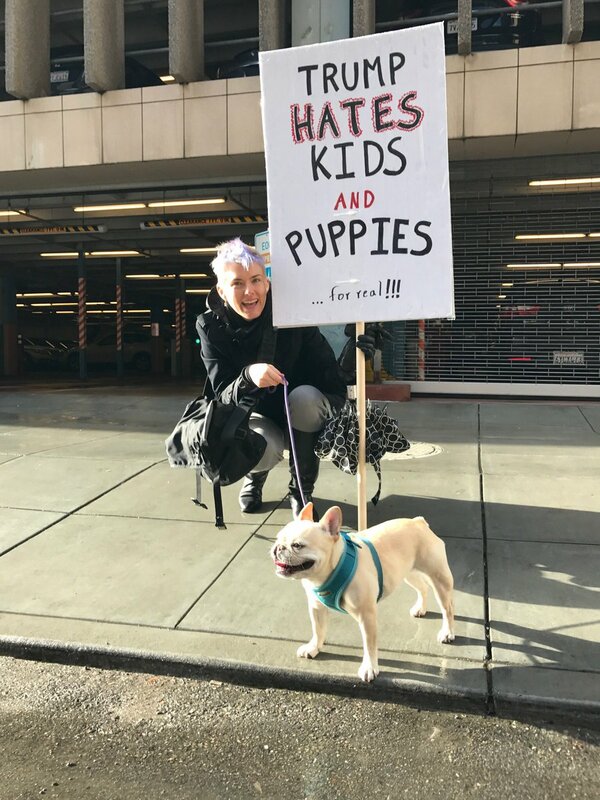 Happy protesting, whether or not you have a sign!